While HIFICRITIC is a quarterly magazine, our total annual product review workload is largely the equal of the monthlies, and we very likely publish more features and music reviews per year than the monthlies. We have the advantage that we do not need to sell our pages to advertisers so we can commission and publish what we like, and offer varied content including serious feature articles that we hope our readers will enjoy. We even publish reviews where product gets no editorial recommendation. Our new summer-autumn edition is a case in point where six contenders were found wanting out of some 23 entrants. Andrew Everard arranged a standoff between two new classic integrated amplifiers from Arcam the SA10 and from Pioneer the A-40AE, and there is a winner. The fearless freelance audio critic Julian Musgrave has dissected a number of mains conditioning products including, Isol-8 Substation LC, Isotek Aquarius EVO3, Nordost Q-Base 6 Mk II and QX4 Quantum Mains Purifier, Shunyata Research VENOM UK6, Vertex AQ (now Quiescent) HiRez Taga & Balanced HiRez Taga, and with surprising results in the circumstances. He also discusses mains supply and sound quality in general. In PASSING NOTES NO4 Julian Musgrave also asks why so many music formats, chooses a cartridge, and then criticises vinyl pricing. 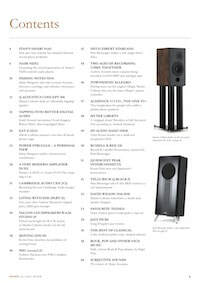 The redoubtable San Curtis pens wisdom on advanced record player design while Martin Colloms revisits the Townshend passive volume control now in ‘Allegri Plus’ form. Colloms also covers, belatedly as it happens, the still inspiring EAT E-GLO all-triode universal phono equaliser. He has also been waiting to get his hands and ears on the flagship Q Acoustics Concept 500 loudspeaker and finds that it handsomely survives an in-depth exploration. Having heard a larger 300 RAM –Falcon at the last Bristol show, Colloms also reviewed the 200 stand mount as a full technical feature. 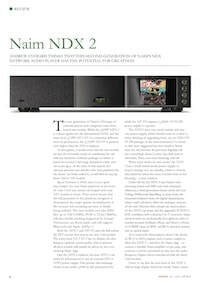 Andrew Everard and Martin share the honours for a timely review of the new Naim streamer, the NDX 2, additionally assessed with the augmentation of the 555PS DR power supply. Andrew Everard has been busy for this issue, visiting Holland to report on a new ultra HD Audio venture, DSD and analogue tape recording. Andrew Harrison has also been well occupied with streamer reviews, including the Mytek Liberty and the new Cambridge Audio CXN V2 streamer/DAC. 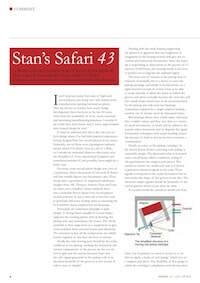 Harrison also provides a detailed run down on DSD file handling, including DXD. 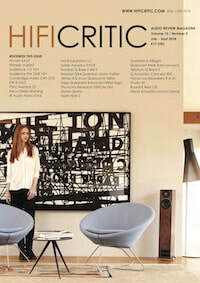 Andrew also contributes a PMC loudspeaker review, here the twenty5.23, featured on our front cover. After an unplanned hiatus Chris Bryant assesses the iFi Audio Nano iOne while Kevin Fiske relates the joys of moving house, and resulting tribulations with his carefully calibrated audio system: Kevin also tries a Quiescent (Vertex AQ) interconnect cable with silver conductors, and met with a surprise. Paul Messenger reviews yet another Russell K loudspeaker system, this time the Red 120 and he also revisits a Tellurium Q speaker cable the Black, now in MK II form. Paul gets his teeth in to the third of the Heco Direct high efficiency series, this time the Einklang which has a single full range driver. If that was not enough he samples a new product from MANA, of historic equipment stands fame, and then tries out tries out the two miniature Audience loudspeakers 1+1 V2+, The ONE V2+. Keith Howard has researched a remarkable story on ultra-long digital filters, as exemplified by designer Roberts Watts of Chord Electronics. We also celebrate the life of Wilson Audio founder David Wilson. 1944-2018. 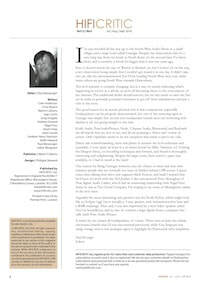 Finally we complete the new issue with our thoughtful and informative Rock, pop, classical, and jazz record reviews.